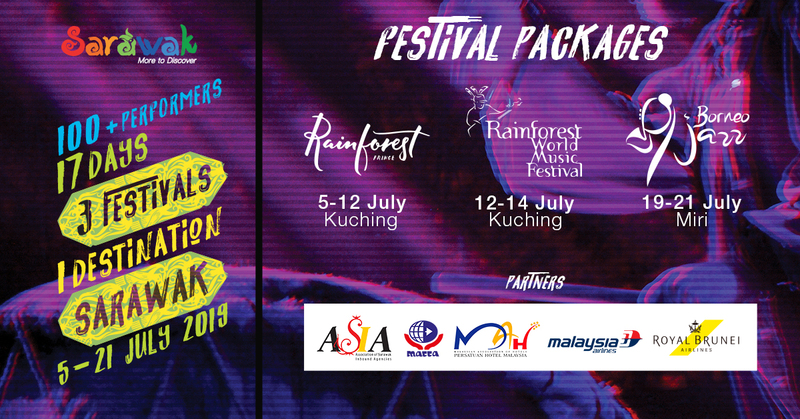 Get ready for the Sarawak Festival Packages in the month of July! For the first time ever, Sarawak’s top 3 most anticipated music and cultural festivals will be taking place in the month of July, back to back! The third edition of the Rainforest Fringe Festival is a prelude to the Rainforest World Music Festival and Borneo Jazz Festival, featuring music, art, craft, film, photography, food, and culture of Sarawak and beyond. The Rainforest Fringe Festival is a free-entry event. Follow the thumbnail links to buy the other festival tickets. Buy Rainforest World Music Festival Early Bird Tickets Now! Buy Borneo Jazz Festival Early Bird Tickets Now! Prices from the following destinations to Kuching, at promotional prices! Only available through the consortium of agents listed below.